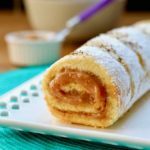 Brazo de reina (also called pionono) is a delicious traditional Chilean rolled cake stuffed with dulce de leche and sprinkled with coconut. In a small bowl, combine the flour, cornstarch and baking powder. Set aside. In the bowl of a stand mixer, beat the egg whites by gradually adding the sugar. Add the vanilla and whisk until egg whites are stiff. Using a spatula, gently fold the egg yolks one by one without breaking the whites. Then fold the mixture of flour, cornstarch and baking powder in the same way, as well as the vegetable oil. Pour the mixture into a 17 x 13 inch rectangular pan lined with parchment paper and well buttered. Spread the mixture evenly with a spatula. Bake in the center of the oven for 12 minutes or until the cake is slightly brown. While baking the cake, spread a parchment paper on the work surface and sprinkle with a tablespoon of icing sugar. Unmold the biscuit by turning it over on the parchment paper sprinkled with icing sugar. Gently remove the parchment paper. While the cake is still hot, turn it over to a board. Spread the dulce de leche evenly over its entire surface, and roll it on itself. If the dulce de leche is too firm, heat a few seconds in the microwave and mix well before spreading it. Place the rolled cake on a serving plate with the seam underneath. Mix the remaining icing sugar and coconut and sprinkle the rolled cake with this mixture. Heat the metal skewer with a flame or on the stove and use it to mark the top of the cake with square grill marks.